Rep André Carson Predicts Sizable ‘Muslim Caucus’ By 2030. Is He Correct, And Will It Matter? 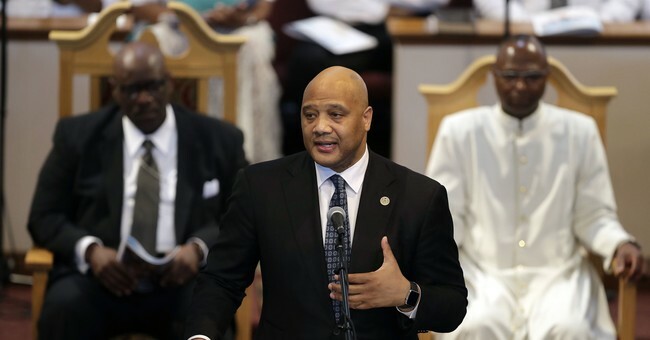 Democratic Rep. André Carson made news last week by predicting that there could be as many as 30 to 35 Muslims in Congress and possibly even a Muslim president or vice president by the year 2030. Speaking to attendees at a “Community Congressional Reception” hosted by the Council on American-Islamic Relations (CAIR) on Thursday, the Indiana congressman welcomed newly elected Representatives Ilhan Omar and Rashida Tlaib - both of whom were in attendance and spoke later - and celebrated the likelihood that their election victories were just the tip of the iceberg that’s to come. It’s all been a pretty big story, in conservative circles at least, because of something we all know, but aren’t supposed to say out loud. If Rep. Carson were, say, an Eagle Scout celebrating the political rise of other Eagle Scouts and predicting even more to come because of the wonderful leadership training program scouting provides (or once provided), nobody would bat an eye. If Rep. Carson were celebrating the rise of fellow African-Americans, especially if he were doing it in front of a group of black Democrats AND Republicans, most Americans, conservative and liberal alike, would celebrate with him. But even so, is Carson right? Will a sizeable “Muslim caucus” emerge in United States politics in the near future. And if so, would that be a good thing for America? The first question is tough to see, at least by 2030. PEW Research predicts the Muslim population in the United States could reach 8.1 million by 2050. If so, it would comprise 2.1 percent of the total population, almost twice the current 1.1 percent share. Sounds reasonable. However, the same article acknowledges that the Muslim population “has been growing rapidly” from its originally small base due to “higher fertility rates among Muslim Americans as well as the continued migration of Muslims to the U.S.” Assuming the Congressional share of Muslims hovers around their overall representation, that would mean about 11 lawmakers by 2050, up from three today. So it would appear that Carson is at least a generation off with his prediction. Thanks to its physical proximity to Muslim countries so many are desperate to leave, Western Europe is in an entirely different situation. According to PEW Research, the share of Muslims on the continent grew from 19.5 million to 25.8 million (from 3.8 percent to almost 5 percent) from 2010 to 2016 alone. “By 2050, the share of the continent’s population that is Muslim could more than double, rising to 11.2% or more, depending on how much migration is allowed into Europe,” writes PEW, adding that even if migration were “permanently halted” (something we all know probably won’t happen anytime soon), the “relative youth and high fertility rates” of Muslims currently living in Europe would still cause the population to rise to 7.4 percent. Some countries project even higher in 2050, should migration continue at current rates - Germany at 19.7 percent, UK at 17.2 percent, France at 18 percent and Sweden at 30.6 percent. What isn’t projected, and what isn’t generally spoken of in polite circles, is where things go from there. Given Muslim birth and immigration rates as well as Europe’s aging population, how soon does a 30.6 percent in, say, Sweden turn into 50.1 percent and a Muslim majority? When this happens, what does that portend for Europe and the rest of the West, including America? Granted, Muslim immigration to the U.S. is hindered by geography, but the overall patterns are unmistakable even here (as André Carson, part of a growing demographic of U.S.-born Muslims, likely well knows), even if a generation or two removed. It’s passé in today’s politically correct society to suggest that immigration should be halted or even limited based on a religion or even a point of origin. President Trump was excoriated for even the perception that he was instituting a “Muslim ban” on travel, although was he was actually proposing was light years from that. These sorts of demographics aren’t supposed to matter or be taken into consideration whatsoever, because political correctness and vague concepts of “social justice” trump observable reality, at least in the warped minds of our elites. You can also decide for yourself whether or not you want to live in one. Our grandchildren and great-grandchildren, on the other hand, may not be so fortunate.